Gilbane Building Company, a leader in construction services, joined several hundred community and civic leaders on July 14, 2016 to celebrate the much anticipated grand re-opening of the South Shore Harbour Resort and Conference Center in League City, TX. 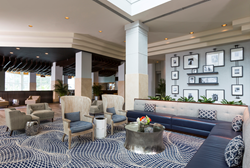 Gilbane recently completed multi-million dollar renovations on the property, located halfway between Houston and Galveston, is once again positioned to become a premier conference and vacation destination in southeast Texas. The lakeside resort renovation includes nautically inspired panoramic water views, new contemporary designs to all 238 guest rooms and two bi-level penthouse suites; 25,000 square feet of meeting space, Oasis resort pool and deck, Paradise Reef restaurant, and the new Lighthouse Bar & Bistro, which is named for its signature view. Other improvements include a new air conditioning system and LED energy-efficient lighting throughout. "We are very pleased with Gilbane's work and the responsiveness they delivered every step of the way," said Scott Webb, assistant vice president of real estate for American National Insurance Company. "Gilbane was a true partner in helping American National transform South Shore Harbour Resort and Conference Center into what is now the most appealing leisure and meeting destination in southeast Texas."